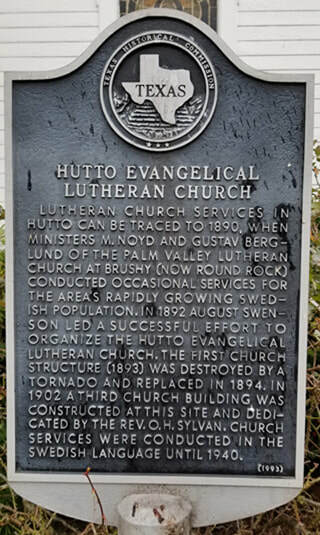 Hutto Lutheran Church was established in 1892 by Swedish immigrants when Hutto was primarily a farming community. At that time, it was known as the Swedish Evangelical Lutheran Church. Today, Hutto Lutheran Church is associated with the Evangelical Lutheran Church in America (ELCA) thru the Southwestern Texas Synod, and has a multi-ethnic congregation that reflects a wide variety of occupations and interests. If you are not worshiping regularly, you are welcome at Hutto Lutheran Church. We invite you, with members of your family and friends to worship with us and become a part of our fellowship. Together, we will continue to carry out the mission of this congregation: to serve residents in the Hutto area thru Worship, Witness, Education and Service.